Christmas is many things to many people. For some, it’s parties and drinks and buying and giving presents, and time off work, and time at the beach or watching cricket or the Sydney to Hobart (if you’re in Australia!) or revelling in the snow and hot wines and hot dinners if you’re in the northern hemisphere. It’s Christmas carols, and Christmas trees, and tinsel and turkey, and family. For others, it’s a deeply religious and spiritual time – a celebration of the birth of an Ascended Master, of a Christ, of someone who showed us just what was possible. For me, it’s all of the above. I don’t ascribe to the current fashion of taking the Christ out of Christmas by saying “Happy Holidays.” This diminishes and trivialises the sacred nature of the occasion. I respect the HIndu holy time of Diwali, and Islam’s Ramadan – and other religious celebrations. Through this blog I have made many friends all over the world. I feel very fortunate to know you all – and to call you a friend. Each one of you has enriched my life, and will continue to do so. I wish you all the very best for this Christmas time – and look forward to sharing stories and feelings and provocative opinions (!) with you this coming year. Dear Bill, Jennifer and all of our PGS family. Wishing you all the Merriest Christmas and a Wonderful, Prosperous 2017!. Dear Bill, Jennifer and PGS family. I wish you a blessed Christmas and Prosit 2017. And a very happy Christmas to you and Jen and your family Bill. Wishing you love and laughter for next year and I look forward to hopefully seeing the PGS film. Many thanks for continuing the blog. In fact, some of us are watching a Christmas movie tomorrow after dinner, Bill, so I think Merry Christmas is definitely in order! It would be terrific to see you again! Merries and Happies!!! Merry Christmas and a Happy, Healthy, Prosperous New Year! And if I may, Merry Christmas to my PGS brothers and sisters as well. May all our wishes come true in 2017! Thanks for all your blog posts. I read your book last year and have thoroughly enjoyed learning about your travels. I’m an ordained minister, but have been out of the ministry for 10 years. I identify with your thoughts about religion, intuition, and approach to life. I also agree with your thoughts about Christmas and so appreciate your sharing them. Hope to walk the Camino some day. People like you inspire me. The best of the season to you and your lovely wife! Keep writing!! Bill, Merry Christmas to you, and to everyone on this blog, Merry Christmas or any holiday greeting that is applicable and makes you happy! George – many thanks. Always great to see you post a comment here. Hope you and yours have a wonderful Christmas too! Here’s wishing you and Jen a very Merry Christmas, Mate, and to all the wonderful people around the world whose lives you have impacted through this blog and your travels. You are truly one in a million and as good of a Christmas as Santa could ever wish for. Terrific post Bill. Thank you. I wish you & Jen and all those who follow your blog all the joys of this festive season. And a 2017 filled with fabulous adventures. May the blessings of Christmas be with you all and may 2017 bring you all everything that is wonderful.
? What is an “Ascended Master”, and why is the Lord only “one of them” ? Otherwise, Happy Christmas to all of you !! So some new age theosophic syncretic deism having exactly nothing to do with Christ and Christianity then ? Julian – just read some of the literature. Allow yourself to consider other points of view. You know the meaning of the word “Christ.” It is not particular to the man named Jesus. Do you believe that the Hindus, the Buddhists, the Islamists, the Toaists – do you think they all worship a different God to the one you worship? There is only one God, and all genuine Worship is directed towards Him, but this does not mean that all points of view, all relativism, all syncretisms, all modernly-created artificial religiosity, all philosophies, all ideologies are equal before Him — as for the Christ, He is the Living Revelation, the Logos, and the Son of the Father. He is God — and ANY suggestion otherwise, such as seeking to diminish Him by calling him a “prophet” as the Muslims do, a “wise man” as many do, or some sort of “ascended master” are intrinsically incompatible with EVERY principle of any genuinely Christian Faith, and implicitly insulting of Christianity itself. Besides — whatever the qualities and defects of theosophy since its invention in the 19th Century, it’s about as foreign to genuine Spirituality as the works of Voltaire are. Julian – I sense you are angry. Why? You seem to want to defend, as though your position, your beliefs, are under threat. Anger stems from fear. What are you afraid of? Fear is the antithesis of love, which is surely what your God embodies? Isn’t Christmas in Sydney amazing Britta? Aren’t we lucky? So different of course to Europe, which has its own special magic. But here in Australia at Christmas, it’s quite unique. 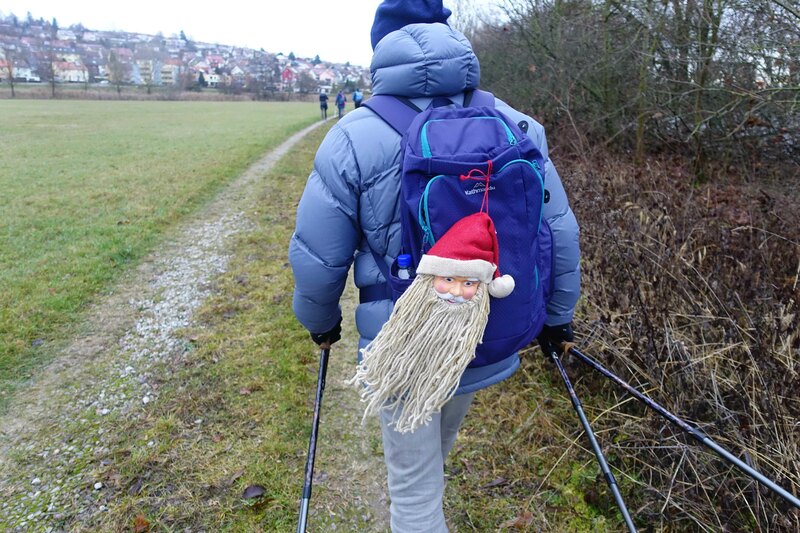 PS – absolutely love the mop Santa in the photo! !